Located in the heart of Sea to Sky Country, Squamish has the convenience of being located 45 minutes from Vancouver and 35 minutes from Whistler (Host of the 2010 Olympic Games). As a growing community, Squamish is officially recognized as the Outdoor Recreation Capital of Canada. Exit East off Hwy.99 at the traffic lights at Clarke Drive (top of the hill about 1km south of Squamish). Immediately head left and then right onto Guilford Drive. Stay left down the hill until the 4 way stop at Westway Avenue. Turn left here and continue for about 2km into the Ravens Plateau subdivision. The Show Home is located at 38640 Cherry Drive. Ravens Plateau at Garibaldi is a uniquely located neighbourhood. Steps from your door the trails and rivers await you. Each season holds an abundance of recreational choices, from easy walks, mountain biking and water sports to playing a round of golf or viewing the thousands of bald eagles that spend time here in the winter. 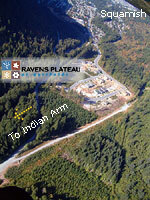 Residents can also take advantage of the direct route to Indian Arm via the gravel road adjacent to Ravens Plateau. 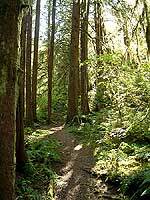 some of the most enchanting trails in southwestern BC. Squamish is world renowned for its many outdoor activities including, rock climbing, windsurfing, horse back riding, golf, and so much more. Is it any wonder Squamish is the Outdoor Recreation Capital of Canada. 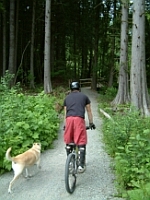 MySquamish.com is a comprehensive, reliable and convenient resource about the community of Squamish. The site includes links to Recreation, Weather & Road Reports, and BC Ferries.